TEXT OF PRESS BRIEFING BY THE ALLIANCE OF CSOs FOR EFFECTIVE BIOSAFETY FOR THE DEVELOPMENT OF MODERN BIOTECHNOLOGY IN NIGERIA HELD IN ABUJA ON WEDNESDAY, JANUARY 18, 2017, READ BY EDEL-QUINN AGBAEGBU, MEMBER OF THE COORDINATING COMMITTEE FOR THIS CONFERENCE. It is with pleasure that we are here again to update you with our position and views with respect to some recent developments in Nigeria in the area of biotechnology and sustainable development. Recall that earlier, on December 22, 2016, we had an opportunity to speak with you to express our position against a campaign mounted by some groups who are opposed to the mention of any name about modern biotechnology and genetically modified organisms (GMOs). We had then introduced ourselves as representatives of Civil Society Organizations assembling under an alliance for the promotion of effective biosafety and the deployment of modern biotechnology for sustainable development in Nigeria. We promised during the past conference to hold regular interface with you, gentlemen of the press, to update you on our position on issues bordering on our chosen area of interest. In today’s briefing, we wish to draw your attention and express our position to a recent statement, attributed to the Honourable Minister of Agriculture and Rural Development, Chief Innocent Audu Ogbeh, during a town hall meeting with youths, in the Banquette Hall of Aso Rock Presidential Villa, Abuja, in opposition to GMOs. The event took place on December 18, 2016 and was published in the Daily Sun newspaper on January 3, 2017. At that public function, the Honourable Minister stated that Nigeria would not embrace GMO seeds. In the statement which the Honourable Minister has not yet refuted, Ogbeh was quoted as saying that the Federal Government of Nigeria was still apprehensive of Genetically Modified Organisms (GMOs) and that he was officially and personally opposed to GMOs, adding that Europe and America was suspicious of it too. “We will try and do our best and stick to hybrids. The only problem we have is that the quality of seeds in the market is so limited. We have three Universities of Agriculture, Brazil has 70 and our population is almost the same”. He charged the Universities of Agriculture to concentrate on their mandate instead of dabbling into other fields like Management, Medicine and Law. He assured the youths that he would soon convene a meeting with them to discuss agriculture, the issues, problems and prospects. These are quite embarrassing and devastating statements and we consider it a patriotic duty to draw both regional and global attention to the contradictions in the Minister’s statements through strategic communications and outreach for informed policy and choice and avoid misconstruing the statements as fact and incontrovertible. We have great respect for the Honourable Minister as an elder statesman and a stakeholder in agriculture and had expected that he would have moved fast to refute the report as it is in contradiction to many statements he had earlier made in support of modern biotechnology and GMOs as a scientific and globally accepted method of improvement on agriculture, food production and fight against hunger and malnutrition towards a sustainable development in the country. We appreciate that Ogbeh, although an Honourable Minister of the Federal Republic of Nigeria, is still human and susceptible to mistakes and misadventures. The statement clearly indicated that he has joined the league of anti-GMOs, in contrast to his original position and to the view of apparently majority of enlightened personalities and interest groups, represented in Nigeria by the Nigerian Academy of Science and internationally by 110 Nobel Laureates who spoke out late last year, supporting Precision Agriculture. It is important to note that Chief Ogbe’s view is tantamount to a policy summersault and a contradiction of an earlier view from his office. When Chief Innocent Audu Ogbeh came into office in 2015, he made it clear that “agriculture is the only option left to grow the economy” as Oil is failing the Country”. On 3rd Febuary 2016, during a visit by OFAB PC members to the Honourable Minister, he expressed his satisfaction with the visit paid to him and clarifications made about GMOs and agricultural biotechnology. He stated that agriculture over the world is facing some challenge like climate change, insect attacks, low yield and productivity and a lot has been done using conventional breeding to solve these challenges. He said Nigeria must embrace modern biotech and also indicated interest in collaborating with all institutions concerned to bring about a proper deployment of biotech especially in the cotton industry. He pledged to work with Monsanto and AATF to revitalize the agricultural sector by applying all forms of technology necessary to bring about increased productivity, yield and increased income for farmers especially as Nigeria is looking forward to diversify the economy through agriculture. At the Biosafety and Biotechnology Experts Meeting, the Honourable Minister of Agriculture said GMOs have been a very controversial subject by which majority of the crowd is guided by sentiments, fear and misinformation. “We cannot be guided by sentiments and fear rather should make decisions based on scientific facts. We are here to move forward to ask the larger public to contribute to the GMO discussions so as to neutralize the fears and sentiment around it. Nigeria has to move forward with science and in-between the fears, misconceptions and reality lies a truth which will be discovered at this meeting”, he emphasized. While concluding his remarks, the Minister thanked everyone for accepting to be at the meeting and urged them to participate well in this decision making process. In May 2016, the Minister was summoned by the National Assembly where he advocated for the use of GMOs in Agriculture. Ogbeh said that the grass that Brazil is selling today came from Africa; which they took and worked on for 18 years and the grass now contain 18 per cent protein, trace elements and amino acids. The Minister appealed to the National Assembly to give more appropriation to agricultural development in the 2017 budget to address the challenge of poor funding. 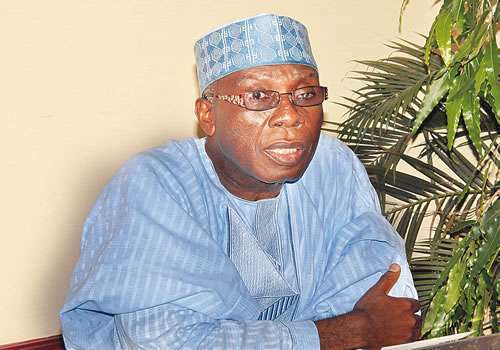 The National Daily Newspaper report said Ogbeh also called for the establishment of a commodity exchange in the country, adding that the exchange, when used with Genetically Modified Organisms (GMO) in the agriculture sector, would contribute immensely in the diversification of the country’s economy. Ogbeh stated these during his presentation at a Sectoral Debates organized by the House of Representatives. In June 2016, the Federal Ministry of Agriculture and Rural Development issued a statement and said amongst others: ”The Public Policy on agricultural biotechnology rests within three ministries in the federal government, namely: the Ministries of Science & Technology, Environment and Agriculture. ”There are two agencies responsible for the control of biotech products: The National Biotechnology Development Agency (NABDA) which is under the Ministry of Science & Technology while the National Bio-safety Management Agency (NBMA) is supervised by the Ministry of Environment. ”Both NABDA and NABMA have biotech-related work as the core of their activities. While NABDA is involved in development and utilization of biotechnology, NBMA is specifically charged with the task of regulation of their use, particularly the Genetically Modified Organisms (GMOs) to ensure safety to humans and the environment. ”The Federal Ministry of Agriculture and Rural Development is concerned mainly with the use of agricultural biotechnology tools, but subject to approval and endorsement by both NABDA and NBMA. ”We are as concerned as every other Nigerian and we realize the need to be cautious in the deployment of GMOs but the matter does not lie with us alone, which is why the Ministry of Agriculture is a little slow to talk about it. We are still doing as much research as we can even as we hold meetings with the other ministries which have responsibility for regulating biotechnology. ”For the purpose of unified communication, the three ministries are meeting to ensure that we get the facts right and all speak with one voice on the GMO issue”. Surprisingly, Chief Ogbeh’s recent view did not reflect those of the other ministries and agencies of government that are stakeholders as well. There should be a synergy between the ministries. Clearly, Chief Ogbeh is standing alone. The Honourable Minister of Science and Technology on March 17, 2016 in a public function stated, “I see a bright future where no Nigerian will go to bed hungry because there is no food to eat, and no farmer will not be able to pay his bills as a result of poor harvest”. He continued that post-harvest losses are not allowed to create food shortages in our country and concluded that “President Muhammadu Buhari is committed to ensuring that science and technology are effectively utilized to serve our nation, feed our people, cloth and shelter them, grow our economy, create jobs for both the young and old and ensure that the rule of law is upheld”. The out-going Minister of Environment, Amina J. Mohammed, equally had stated at a public function in Abuja that government would not be swayed by the cacophony of views on GMO, but would instead aggregate and subject them to scientific studies. That is a painstaking, scientific process which credible minds are following globally. In a public presentation made on November 10, 2016, she wrote, “Distinguished Ladies and Gentlemen, let me assure you that the President is committed to ensuring food security. This can be seen from the recent signing of the historic Paris agreement by the president. In furtherance of this commitment to zero hunger, the government will welcome technology that will provide safe and adequate food for Nigerians, hence the government established the National Biosafety Management Agency (NBMA) to enable Nigerians benefit maximally from the practice of safe modern biotechnology”. It is appalling that the Federal Ministry of Agriculture that has over fifteen (15) Agricultural Research Institutes nation-wide should be arguing about a technology that has been used for over twenty years and thrives well in other advanced countries. Europe consumes over 16 billion dollars worth of GMOs for various purposes and America has commercialized this product for more than twenty years. It appears Chief Audu Ogbeh is not conversant with matters of appropriate safe technologies in the development of the agricultural sector for food security and there is a disconnect between him and the Research Institutes under him. For instance, the hybrids he referred to are products of biotechnology which implies that his team of advisers have dearth of knowledge on science and technology. Fortunately, he is surrounded with experts that understand the basics of science and technology to drive modern agricultural technology in the face of the growing population and demand for food, feed and fiber. He should seek expert advice from his research institutes and work closely with them. The fact still remains that no country can survive without research and innovations. It should be understood that there is a trade war between the proponents of biotechnology and agro-chemical industries and the so-called organic farmers. But Nigeria has enough scientists to give the right direction towards national food security, not to take directives from Europe and America. It should be realised that modern technology is based on scientific discoveries of scientists such as Galileo, who was initially condemned to death for stating that the world is spherical. Chief Ogbeh needs to familiarize himself more with the position of the Food and Agricultural Organization (FAO) on GMOs. He should be proactive to save Nigeria from the eminent hunger that is threatening the African continent, going by the current drought that is ravaging Somalia, Kenya and many other countries in the horn of Africa. We want to join the 110 Nobel Laureates who spoke out proudly last year, supporting GMOs in asking this great question: How many poor people in the world must die before we consider this a “crime against humanity”? Nigeria cannot be an island in the international community and as a model to other African countries must not commit a blunder in making statements that does not have a scientific balance. Science is not politics or a game of number but facts. We will be glad to hear and indeed would commend the Honourable Minister of Agriculture if tomorrow he stands up to make a public statement to withdraw his statement and join other enlightened minds and groups in Nigeria and globally, to support a painstaking process for seeking ways and means of increasing agricultural yields, food supply, fight against hunger and pests, which are sustainable paths which supporters of modern biotechnology and biosafety represent. We urge him to toe the path of honour and clarify his thoughts on this.